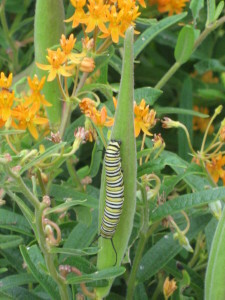 Monarch caterpillar on a Butterfly Milkweed (Asclepias tuberosa) plant. You can tell the difference between a monarch munch and a tussock munch by the edge. The monarch leaves a smooth edge, while the tussock leaves a more jagged edge. Fellow Wild Ones Fox Valley Area Chapter member Lucy Valitchka brought this article on Common Milkweed Insects to my attention. I found it really interesting and thought you would, too. I have been aware of the Milkweed Tussock Moth’s use of the milkweed as their host plant. I have washed away overwhelming numbers of bright yellow aphids. I have seen how dirty looking the milkweed plants get later in the fall. But I did not realize just how many other insects rely upon milkweed and why I’ve seen what I’ve seen. Common Milkweed Insects is a very interesting article! Note: As Susan Mahr mentions in her article, monarch caterpillars typically prefer younger shoots of milkweed, so I often cut back some of my milkweed plants in late July/early August. This will cause the milkweed plants to resprout with new young leaves before the birth of the last generation of monarchs which will need to migrate to Mexico. 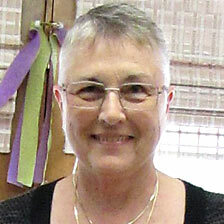 Click on link below to read Susan Mahr’s article which appeared in the UW-Extension Master Gardener Program August 17, 2018 blog. Sounds like a great idea, Toni. I do have Dogbane in my prairie. Have a good Labor Day celebration!